Snowstorm reads — writing on comics, film, music, etc. Nice, reflective piece at Full Stop Mag on Leanne Shapton’s Sunday Night Movies. Out now from Titan Comics, French sci-fi epic Snowpiercer gets a look at Verge. Great essay on Japanese artist Mizuki Shigeru & American horror comics at Comics Bulletin. A whole bunch of new comics get reviewed at The AV Club, including Deadly Class, Nijigahara Holograph, and more. At The Comics Journal, Robert Stiebel looks at Jack Kirby’s work in a 1968 issue of Captain America. 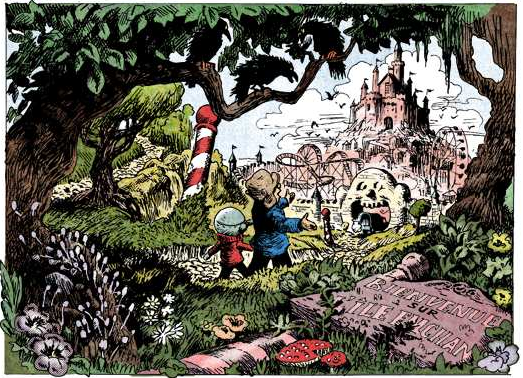 Writer Zainab Akhtar on the wonders of French comics creator Gilles “Boulet” Roussel. Drawn & Quarterly has issued a print collection of Michael Deforge’s ant comics. They’re wild, and I wrote about the book for The Chicago Reader. The February issue of PRINT has a lengthy piece from Michael Dooley on censorship of comics & graphic novels in U.S. I posted about this piece here. Great Forbidden Planet Int’l post on Nick Sousanis’s doctoral dissertation, which he’s preparing in comics form. Wow: Pinocchio from French comics creator Vincent “Winshluss” Paronnaud. First deluxe edition of DMZ from Vertigo is out, with loads of bonus content from critic Justin Giampaoli. Writer Colleen Mondor on a whole lot of new graphic novels & more. They really love Thor: God of Thunder at The AV Club. Previews there look great. Writer Ned Raggett looks back at New Order’s Technique at The Quietus. Liumin is gorgeous. A Norwegian train journey soundtracked by the whole DeepChord / Echospace album. A Stephen King book annotated by a man who would adapt the novel for film masterfully (although King disagrees). On the typography employed in Stanley Kubrick’s 2001.